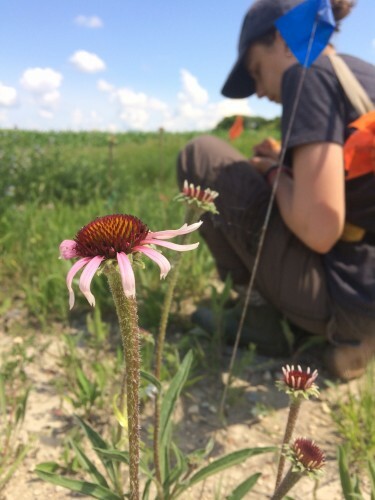 Team Echinacea has collected style persistence and seed set data in remnants in many seasons since 1996. We use style persistence and seed set to assess the reproductive fitness of individuals in remnant populations. When a style, the female reproductive part of a flower, receives compatible pollen it shrivels. So we use style persistence as a measure of mating success. Rows of persisting styles indicate that heads are not receiving compatible pollen. This can be due to lack of pollinators, but we have found that it is more likely due to lack of compatible mates. We visit heads every third day during its flowering time to count the number of rows of persistent styles. We collect seed set data on few individuals in remnants to avoid disturbing the natural reproductive dynamics of populations. Volunteer citizen scientists help clean collected heads in the lab. We x-ray or weigh achenes to assess if they are full or empty.